The Indian Embassy in Ankara inaugurated a festival Wednesday to celebrate the cultural ties between India and Turkey. “We have travelled over land, crossed seas and bridged the skies for business and the exchange of ideas,” Bhattacharyya said. Battacharya said the “mega-festival of India in Turkey” is being hosted for the first time and will be held annually. He said the festival will feature 10 different art forms. Classical Indian music and dance, Indian blues and funk and Sufi music will be performed. Yoga and Ayurveda, a traditional healing system, will be introduced and workshops for Bollywood dance will be organized. Puppet theatre performances and a rare photo exhibition of Mahatma Gandhi, also known as the father of the Indian nation, will also be held during the festival. Visitors can also enjoy an Indian food festival and a fashion show. 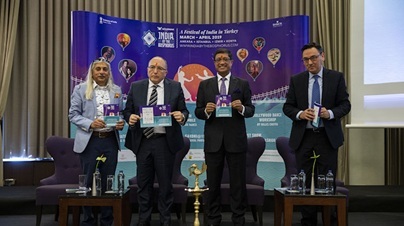 Battacharya told Anadolu Agency that around 160,000 Indian tourists visited Turkey in 2018, up 80 percent from 2017. “There has been tremendous growth in the flow of tourists from India to Turkey,” he added. The envoy stressed that only Turkish Airlines has direct flights between India and Turkey, operating seven flights to New Delhi and seven to Mumbai. He added that beginning March 21, 2019 another 14 flights will be operated by Indigo Airlines. AhmetHalukDursun, Turkey’s Deputy Minister of Culture and Tourism, stressed the importance of culture as a way that societies integrate. “Art is perhaps the most beautiful and effective way to introduce and convey this culture,” he said. “The cultural richness of India, which we always see as a friend and sister country, has aroused the curiosity and interest of the people of Turkey,” Dursun said. Sanjoy Roy, managing director of Teamwork Arts, said Turkey and India have much in common, from literature to architecture, food and dance. “Most people in India have Turkey on their wish list to discover the many wonders you have,” Roy said. Roy said Turkey offers so many opportunities for Indians preparing to get married. “The wedding is the peak occasion, and everybody looks to make their festival special,” Roy said, adding Turkey will be the next destination for Indians to organize their special day. Roy said a reason for Indians to choose Turkey as an international route for weddings is that India finds Turkey’s culture similar to its own and Turkish people are “efficient to work with” and “hospitable.” Roy also said the cost of a wedding is cheaper than in Europe or other parts of the world. Leading artists of India will present performances during the four-day festival, which will showcase the diversity of India. The festival will be held from March 20-24 and April 15-28 in the cities of Ankara, Konya, Izmir and Istanbul.